I am really disappointed that I missed the train for Germany for our virtual culinary tour around the world, as I was planning to participate but I lost track of the time, so my Pigs in a blanket, will have to wait before I lose another train and I am now heading right away to Paris. Paris is one of the few cities I have been dreaming to visit since I was at School (decades ago) as I graduated a French Convent School, in Limassol, Cyprus, L’ Ecole de St. Marie, where the main language we learned was French and all the main lessons, history, maths, literature, geography, science etc. were taught in French. However, although at the time I finished school, I had a degree with which I could teach French in Greece, I never used it and have never practiced French although I do understand French and can still communicate quite well. By the time we graduated we knew everything one has to know about Paris, I could easily find my way around visiting the Eiffel Tower, or Montmartre, Notre Dame de Paris, La Place de la Concorde, Sacre Coeure, Le Louvre, Les Champs Elysees, or just walking across the Seine River. I remember a funny story one of the nuns would tell us that when she visited Paris, she was very tired and wanted to rest and sat outside Le Moulin Rouge, which at the time, morals were very strict and it was considered by them as the House of Devil or something similar and it had a very bad reputation for a nun to even pass from there. When we last went to France, I bought a little cookbook in French, and since then I’ve cooked a few recipes from there. I made tartiflette, pork chops and caramelized onions and I also made Coq Au Vin, as I still had some rooster our friends sent us from Crete. I did some changes, however, to the recipe and I made a healthier and lighter version. I skipped the lardons (pancetta or bacon) and instead of using butter, I only used olive oil. I also skipped the mushrooms as my daughter doesn’t eat them. I wish I had money to visit Paris, but traveling around the world costs a lot of money so we are taking this virtual trip and pretend we are there. Would you like to become virtual tourists like us? 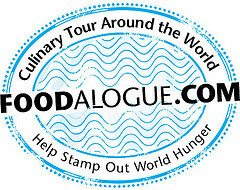 Come and join us and have A Culinary Tour Around the World, organized by Joan of Foodalogue. Our virtual ‘trip’ into various cultures is to motivate readers to participate in the fight against hunger via the World Food Programme and other worthy organizations, so there are still many trips where you can join us. Prepare the rooster to marinate from the previous day. Wash and cut the rooster into serving pieces and place in a large salad bowl with 1 onion, the carrots and celery, bay leaves, black peppercorns, oregano and dried thyme, cover bowl with lid or cling film and refrigerate. The following day, cut off the root end of each shallot and then peel. Heat the olive oil and sauté the onions and remove to a platter before they brown and set aside. Remove the rooster from the marinade and sauté on both sides. Add garlic and sauté for a few minutes, add the marinade ingredients and the coarse sea salt, add water and cover sautéing pan. Bring to a boil, lower heat and simmer until rooster is almost cooked (depending on the size of the rooster, it will take about an hour or more). Add onions and continue cooking until onions are soft and the sauce has thickened. You may need to add some more water, depending on cooking time. Previous Post: « Thank you my friends. A delicious dish! Really pleasant and so comforting! This Coq Au Vin looks scrumptious, er, magnifique! I love Coq Au Vin, but have only made it once–with all the bad ingredients you mentioned! This lighter version is a definite keeper and one you can make more often because of its fewer calories and lower fat content! I love coq au vin. I have made them few times but then i have to admit it was with chicken and it is not same.These look so yummy delicious. When I first started reading I thought you had literally missed your train!! That looks amazing, a wonderful comfort meal! Joan must be really happy to have you travelling with her 😀 Hopefully I will join you in Paris too! What a lovely post Ivy! I too enjoy hearing stories of the past. I also like your adaptation of this recipe…very hearty and warming! Your Coq Au Vin looks delicious! On the plate and in the pan. yum yum! I love coq au vin–at least, I live the kind I can get here in the states where rooster is a rare meat. Your dish looks delicious. I hope you do get to visit Paris again soon! and yes, loved reading the story too! Those pearl onions in the dish are so pretty… can’t make this, but those onions just caught my eye. Ivy, I love the postcard(s)…how creative, what fun! Sorry you missed the train in Germany but it looks like you got to France before me 🙂 Your coq au vin looks very tasty — and good for you to make a bit healthier. Oh that photograph makes me want to lick my screen. I absolutely LOVE Coq Au Vin….my mom makes it all the time…drool..yours looks lovely! There are similarities to coq au vin and kokkoros krassatos. It’s a wonderful winter dish and perhaps leave the mushrooms in whole so your daughter can pick them out/aside? Nice healthy changes, a Greek twist if you will. oh my goodness, this makes me drool! your coq au vin looks absolutely delicious! i gotta cook this tonight! A virtual welcome to Paris! Your version of Coq au Vin looks delicious. I like to use juniper berries in mine and some tiny hot peppers I find here called “pili-pili” 🙂 Also the French often make it in a pressure cooker, which reduces the cook time. What a beautiful post which reminds my days in Paris! I did all my studies in French and attended University in Paris and my family stays there! I tasted many times coq au vin , just love the juicy flesh! U make me nostalgic Ivy! I love that it’s stewed with the simplest of ingredients – give it a French name and it becomes uber elegant. I’ll have some crusty bread with that too please. Beautiful coq au vin, Ivy. And I love that you did it the traditional way with the rooster. It can be time consuming but So delicious. What an interesting high school experience. I wish I had kept on track of the deadline for this event because I have a recipe from France that I have been meaning to make. Your coq au vin looks delicious. Definitely something I would like to try. I have heard of coq au vin before, but have never tried it. Using rooster sounds delicious. I love coq au vin but haven’t made it in years. Yours looks so delish! This looks absolutely delicious! I love your postcard, too – you’re so creative, Ivy! Delicious. Simply delicious. An amazing recipe with amazing flavours. Thank you for sharing this with us. Vin) – Kopiaste..to Greek Hospitality ?